I love this workspace a lot. Filled with natural light, the textures of the wall left raw contrasts beautifully with the industrial metal lockers from Danish design company House Doctor DK. 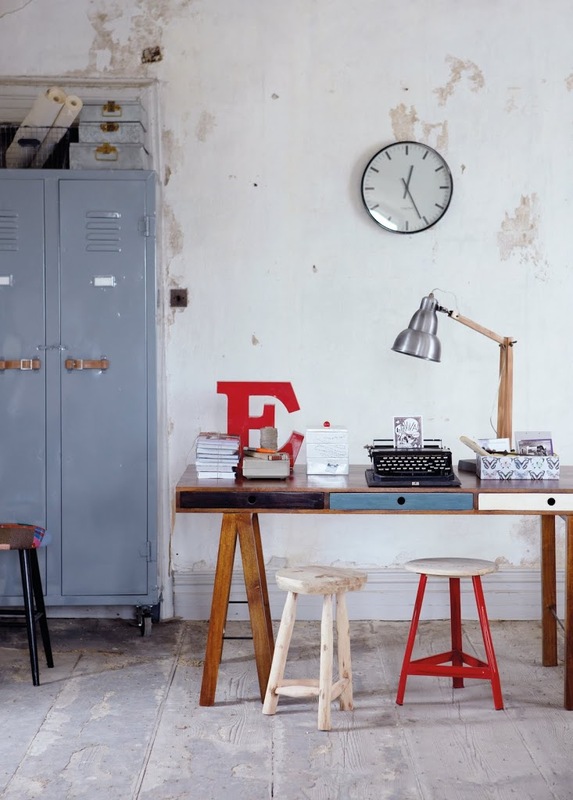 The red accents of the E metal letter and the metal stool adds an uplifting touch of colour while the vintage typewriter and stationary add warmth. yup, i love that image too – particularly the lamp. we’re moving at the beginning of may and i think i might have to put it in our new place! Yes, I love House doctor too! I have lots of their good looking design my self. I really like this image, this industrial style is one of my favorites, love the lamp. you have a neat inspiring blog. Come check out my blog. I am ever on the lookout for stools. Now I feel inspired to blog about my favorite stools. Thanks! For my new kitchen wall I have a certain metal drawer in mind with lots of little doors… EAT would look great on top of it ;) I got the metal plates with Cafe already… I do wonder how the T would remain standing though .. Completely agree – it’s so unpolished yet so chic. Love it! I love the desk — AND its even got three little incredibly useful drawers.